Cuchifritos is proud to present Andrew Deutsch & Ann Hamilton: The First Line (Sounds for Drawing). The culmination of a decade-long exchange between the two artists; a forum for public participation; and an experimental drawing project, this installation was initially conceived for the Burchfield-Penney Art Center at Buffalo State College (and was most recently presented at The Tampa Museum of Art). Inspired by an observation Ann Hamilton made that the soothing, sweeping sounds of her pencil and hand moving across the surface of the paper while drawing seemed akin to the lyrical cadences of overlapping whispering voices, Andrew Deutsch positioned microphones close to her body as she chanted almost unintelligibly and drew the graphite work (seen here) above the drafting table. Now the focus of this interactive kiosk at Cuchifritos, the original recordings were filtered and remixed to create soundtracks for drawing. Striving for a deeper engagement with the art on offer, The First Line (Sounds for Drawing) is intended to function as a richly immersive experience. According to Jade Dellinger, guest curator for this project: “Both artists view collaboration as integral to their practice and share a keen interest in the impact their work – individually and collectively – has on those who come in contact with it. As much an ever-growing archive as an art installation and accruing meaning through use, The First Line (Sounds for Drawing) encourages visitors to take a ‘hands-on’ role by contributing a drawing in response to the audio selections provided.” All of the drawings collected as part of this installation at Cuchifritos will be used by Ann Hamilton and Andrew Deutsch in the production of “digital remixes” to be exhibited, published and/or performed in the future. Perhaps best known for experimental work with John Cage and on-going sonic explorations with Pauline Oliveros, Stephen Vitiello and Tony Conrad, Andrew Deutsch identifies himself as a composer, graphic artist and video-maker. As the United States representative at the 48th Venice Biennale in Italy in 1999; the subject of numerous major exhibitions; and a recipient of the prestigious MacArthur “Genius Award” Fellowship, Ann Hamilton is widely recognized for her site-sensitive, multimedia and performance-based installations. This exhibition is generously sponsored by the PUNO Museum of Contemporary Art as part of their ongoing effort to redefine the role of the museum in our communities. PUNO MoCA will be hosting workshops in conjunction with The First Line (Sounds for Drawing) in Peru. 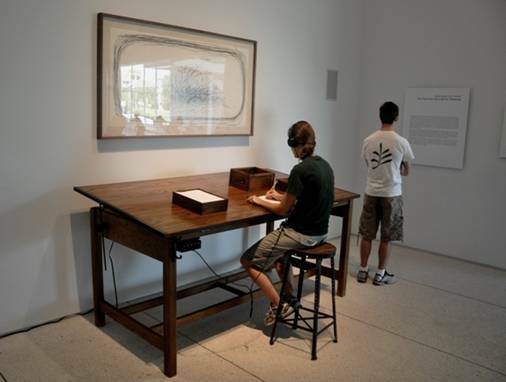 Image: Installation View, Tampa Museum of Art, 2010.